While renovations go on in the basement, I'm still pondering which direction to go in with Chloe's new bedroom. Though HandyMan isn't that fond of this Coronata wallpaper, I can't seem to get it out of my head. 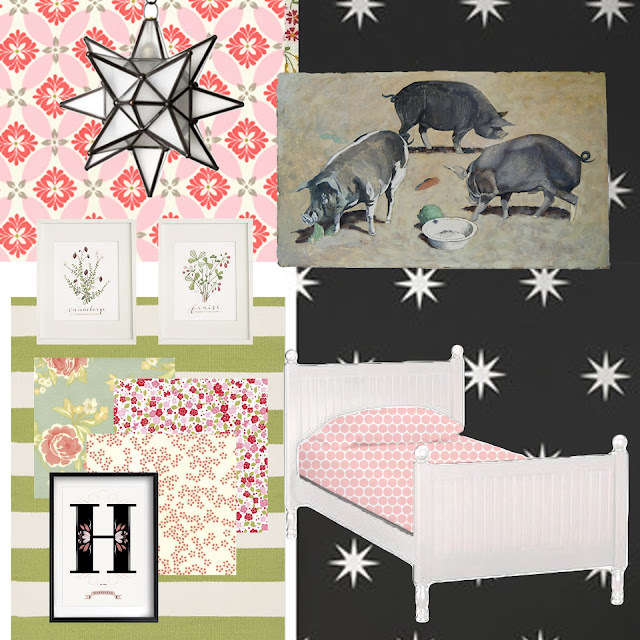 The instant I saw it, I knew I wanted to pair it with the 3 little piggies painting I picked up at Furnishings On Consignment eons ago. The piggies were meant to live in this room! But black wallpaper in a child's room is a tricky thing. To keep it from being too heavy, I would paint the remaining three walls white. The room needs colour though so picking up on the hints of green in the painting, I'd put a fun stripey green rug on the floor and sweet botanicals in crisp white frames on the walls. Floral fabrics big, small, and graphic amp up the country feel. And how about the folksy quality of the "H is for Happiness" print? It gives the necessary hit of black to keep the room more modern country and less Laura Ingalls. The ever-popular Moravian Star is the perfect fixture for this little's girl's room. I can already picture Chloe reading in bed, looking up at it. Its like the mini-me version of our bedroom chandelier. What do you think? Would you use black in a child's room? On a totally unrelated note, the annual Apartment Therapy Homies are out and we've been nominated! Thank you SO much to those who've already cast a vote our way. If you'd like to vote for us too, you can do that here. And even if you don't want to vote, check out the list of nominations. Its a great way to find some new blog reads!